10 Minute Garlic Butter Baked Shrimp is an easy recipe for perfectly cooked, garlicky, buttery shrimp that is baked on a sheet pan in just 10 minutes! I don’t eat nearly as much seafood as I would like to, but I have a feeling that is all about to change. You see, my kids are finally coming around to the realization that seafood is ah-freakin-mazing. This is a 100% bonafide mom win and I am so excited to start adding seafood to our weekly menu plan. I myself have always loved seafood, in general. My family, on the other hand, has taken some persuasion to get on board with incorporating seafood into our daily meals. To get them over to my seafood-loving way if thinking, I began introducing it slowly. I started out by keeping an eye on the seafood counter whenever I went grocery shopping. I would pick up a little bit of whatever was on sale. Sometimes it was shrimp, sometimes it was lobster, and sometimes even scallops. Naturally, I splurge on some wild caught salmon when it comes around, too! I always presented the seafood as an accompaniment to another protein (hello surf and turf!) so that my kids would go into panic mode. I offered them a little bite of seafood here and there with whatever they were eating and, by gosh wouldn’t you know it, they actually started to like it. I’m not gonna lie, a little ramekin of melted butter on the side may have helped to get the seafood into their mouths, but the point is THEY ACTUALLY LIKE IT. Now my son’s favorite meal is salmon. And my daughter requires her own lobster tail whenever we have it. Sure, seafood puts a little more of a strain on my grocery budget, but I absolutely love that I can mix something like this sheet pan shrimp into our dinner rotation whenever my heart desires. 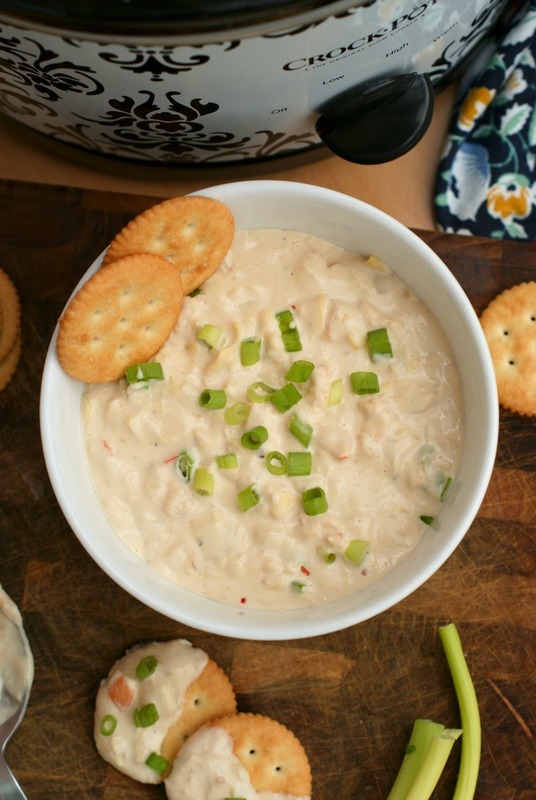 It doesn’t get any better than an easy recipe like this when it comes to seafood! I mean, 10 minute shrimp? Easy peasy and so darn quick. There are lots of easy ways to prepare shrimp, but this one is great if you need or want to try the oven route. So now, let’s get on to the recipe nitty gritty so you can start getting your kids into the seafood groove. If not, more for you, right?! Ha! To make baked shrimp, bake peeled shrimp tossed in melted butter and garlic in the oven (on a sheet pan covered in foil) for 8-10 minutes at 400°F. Scroll down for detailed recipe instructions. Alternate methods of cooking shrimp are sauteing or steaming. This baked shrimp recipe is a great base for additional seasoning! 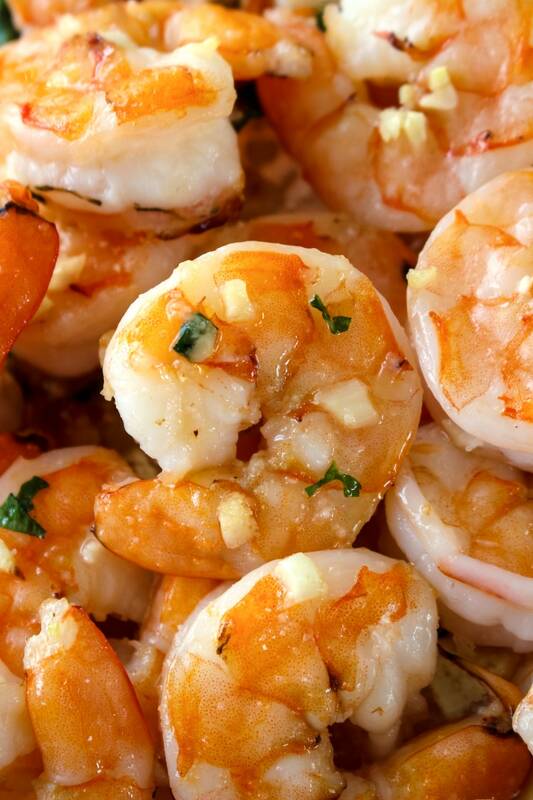 Try adding fresh lemon squeeze over the shrimp after removing it from the oven. Fresh or dried herbs such as dried Italian seasoning, fresh parsley, or fresh basil also make a great addition to the garlic butter. 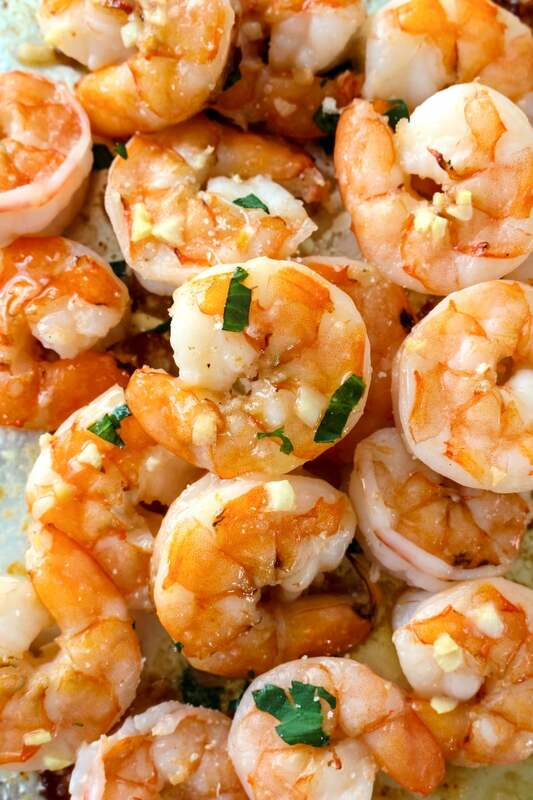 Baked shrimp can be eaten as a stand-alone protein served with a simple side dish. 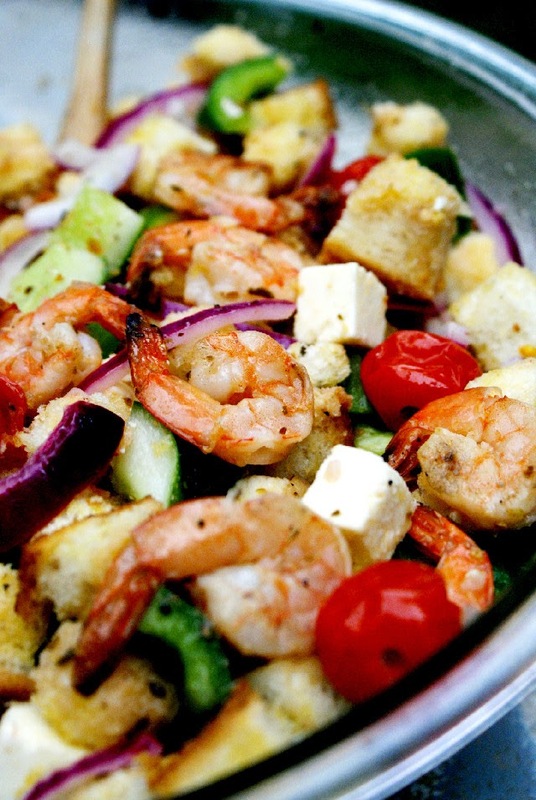 This baked shrimp recipe is also great served over a garden or Caesar salad, or over pasta. WHAT SIZE SHRIMP SHOULD I USE? Fresh shrimp is sold by the count, so look for shrimp that measures 16/20, meaning 16 to 20 shrimp per pound. 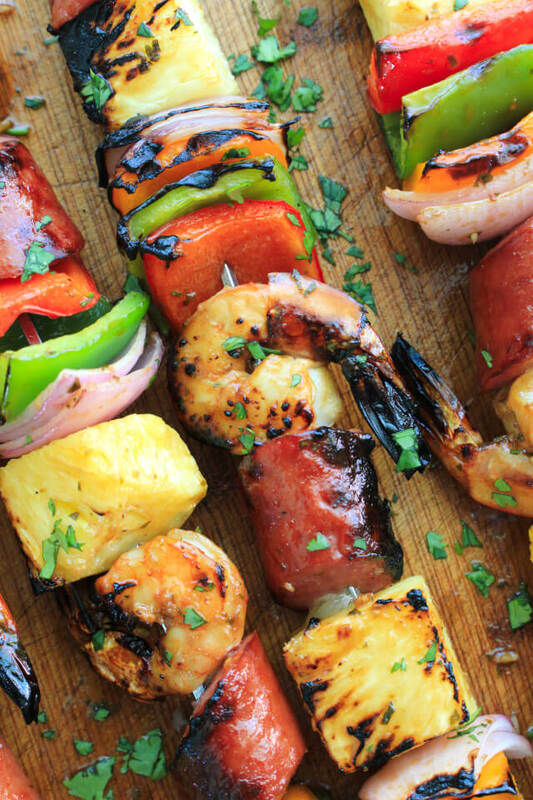 If you buy smaller shrimp such as 21/25 or 26/30, you can shorten the cook time to avoid overcooking. You can purchase shrimp that is already peeled and deveined, or you can prepare the shrimp yourself. To peel the shrimp, pull off the shell and discard. You can leave the tail on or pull the tail off, depending on your preference. To devein, use a small knife to score the back of the shrimp from the tip to the tail. Use the tip of your knife to pull out the vein. Some people score the underside as well to remove the vein there, but it is not required. 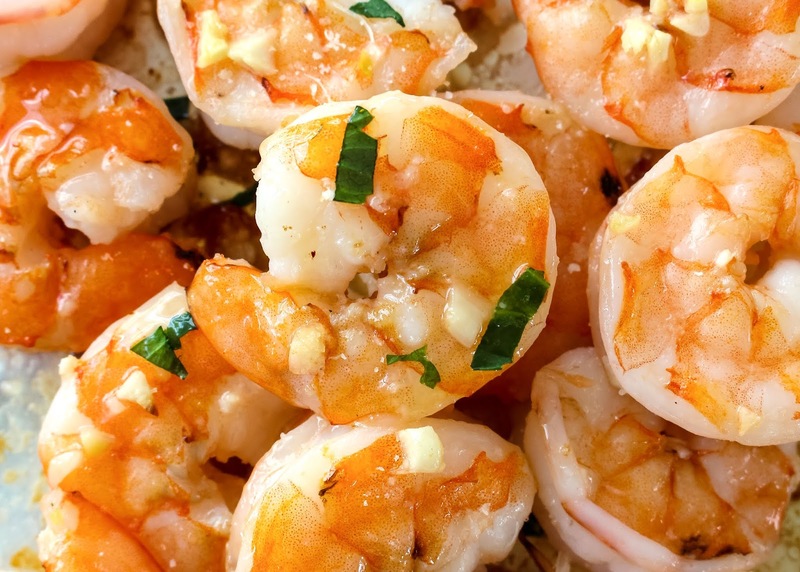 Leftover baked shrimp can be stored in an air-tight container for 3-4 days. Leftovers can be reheated in a small frying pan over medium heat or on a baking sheet in the oven at 350 degrees F until just heated through. I do not suggest microwaving leftover shrimp. 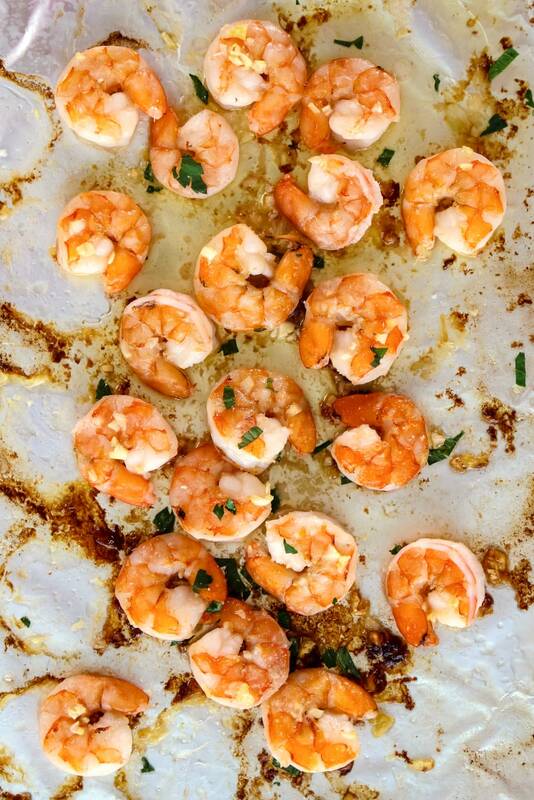 Garlic Butter Baked Shrimp is an easy recipe for perfectly cooked, garlicky, buttery shrimp that is baked on a sheet pan in just 10 minutes! 1. Preheat your oven to 400 degrees F. Line a baking sheet with aluminum foil. 2. 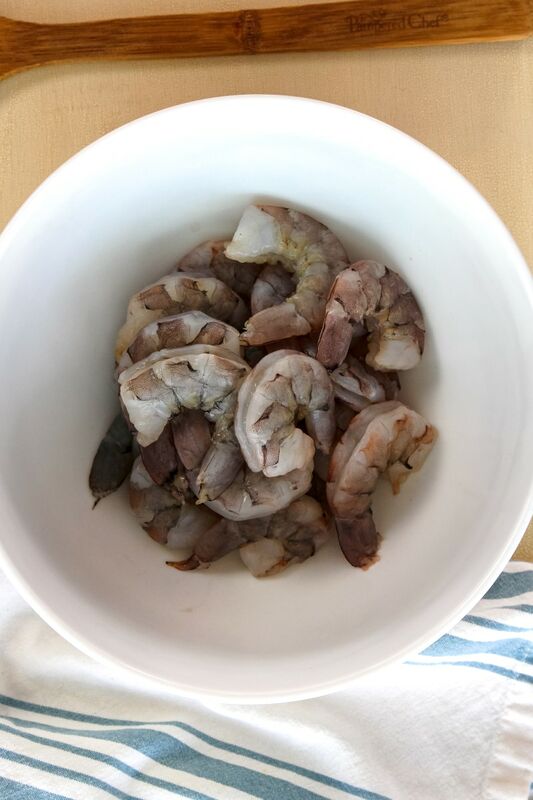 Place the shrimp into a large bowl. 3. Place the garlic and butter into a small bowl and cook in the microwave for 1 minute or until just melted. Remove from the microwave and stir. 4. Pour the melted butter and garlic over the shrimp and stir to coat. 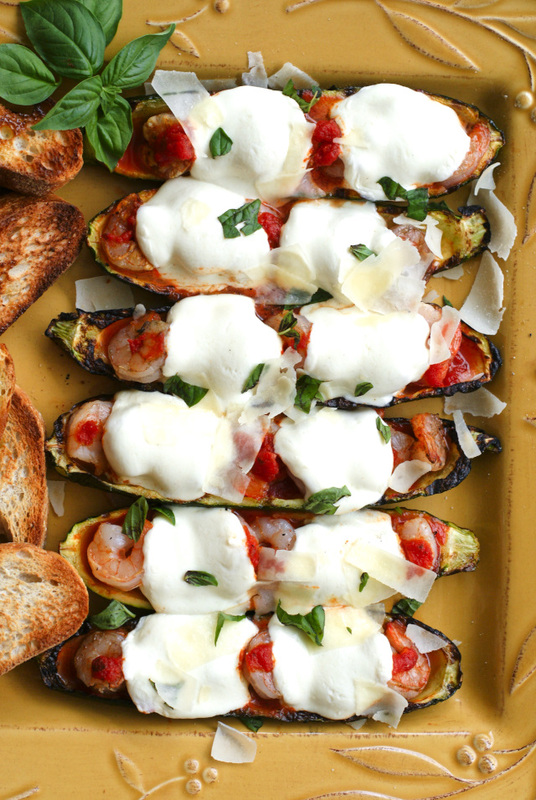 Arrange in a single layer on the prepared baking sheet. Pour and remaining butter in the bowl over the shrimp. 5. Bake the shrimp in the preheated oven for 8-10 minutes, or until pink and cooked through.